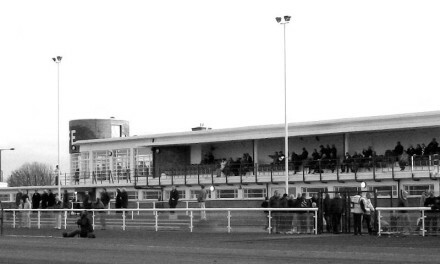 Comings and goings and rumours of financial woe have dogged Hyde this week, Jenni Silver looks at the goings on at Ewen Fields. Hyde recorded their biggest victory in eight years when they beat Stafford Rangers 5-0 last Saturday, a decent enough win to buy the Manchester side a bit of Blue Square North breathing space. This win, however, is now but a distant memory and instead fans of the team, formerly known as Hyde United (before Ewen Fields was blue-washed and covered in badges and sponsor boards for Manchester City) have enjoyed a week of bewildering rumours and uncertainty. On Sunday chairman Steven Hartley and director and secretary Tony Beard resigned from the board “due to a number of issues which they believe make it impossible to continue to act.” This was followed on Monday another of the club’s directors David Farrington and the woman who runs the club shop, Joanne and comes on the back of a vote of no confidence against two members of the Supporters’ Trust. Today the replacements were revealed – with two new board members, an acting chairman and a new chief executive. Meanwhile Supporters Trust secretary Andy McAnulty has become the new secretary, resigning from his trust position and his role as a moderator on the unofficial forum in the process. It comes as no surprise to many Tigers’ fans that John Manship is one of the new board members, the music trader from Melton Mowbray who has been ‘helping out’ Hyde financially for most of the season is now the ‘A Shareholder. ‘ And much of this week’s upset, played out over the fans’ forum, stems from concerns that he might walk away from Ewen Fields now his son Tom has been loaned out to Corby Town. Indeed some fans at Corby’s game against Gloucester City on Wednesday night expressed their wish that the businessman, who is one of the largest dealers in soul records in the UK, might transfer his financial support to the Rockingham Triangle. “Due to cash flow last year, and to avoid any such action (from HMRC), Mr Manship paid one month’s tax in September, and a further sum of a similar amount in November which was intended to be repaid. He added that Mr Manship had suggested players should not be given wage cheques if there was no money to pay them (not such a daft idea really) and that he’d covered the wages for a week because he hadn’t wanted to the players to go into Saturday’s big game against Stafford unpaid. But this evening John Manship took to the airwaves and, in a forthright interview with Tameside Radio, and cleared up a few of the rumours and worries. Firstly, he assured fans he is at Ewen Fields for the long term. Mr Manship also welcomed his fellow new board members – Ted Davis, a former scout who lists Chelsea, Manchester City and Charlton Athletic among his former employers and is still keeping his hand in as a player assessor for the Northern Ireland national squad and Howard Eggleston, owner of sports firm Pelada and a long time Hyde fan. Using words like ‘integrity’ and ‘investment’ again and again in his interview with Mike Pavasovic, Mr Manship hinted at some of the unrest behind the scenes but revealed he had paid the club’s tax bill this week, the players have been paid and there is no need to worry. But the fact that finances have come back to haunt Hyde is a worry. On September 24 2009 the club was wound up, with a hefty £120,000 HMRC bill. But thanks to a gargantuan effort from the fans (and a big helping hand from Manchester City) the winding up order was successfully appealed six days later and the High Court decision reversed. Hyde got out of jail – but not for free, in return for the helping hand of Manchini’s men the team were obliged to turn Ewen Fields into a effectively the Manchester City Reserves, painting the stadium blue, dropping the word “United” from their name and swapping their old red strip to a more acceptable blue hue. The fact that, like most non-league clubs, Hyde’s revenue is struggling does not come as a surprise but surely after the gigantic High Court shaped warning they got back in 2009 how did they get to the point where they were struggling to pay players again? Mr Manship admitted the Man City deal had hammered commercial investment – no advertising boards for Hyde are allowed alongside the imports from Eastlands – but said he was working on it. He also indicated the 7% drop in attendance and poor programme sales could be down to Hyde’s blue-washing. He ended by saying he’d like to have a look at the club’s books – to see where the money he and the Supporters’ Trust had invested had gone. While it was not the most in depth interview, and Mr Manship didn’t give away much, his recognition that Hyde lost part of their soul with the Man City deal echoes the thoughts of many fans and his continued investment will come as a great relief. With their nearest league rivals Stafford’s wage bill cut by 30% this week, Hyde’s chances of survival in the Blue Square Bet North are looking a lot rosier, and the off the field blues might be over too. If you dance with the devil, the devil don’t change. The devil changes you.